The statement by Chile’s Lower Legislative Chamber implores the United States to respect international norms of non-intervention. 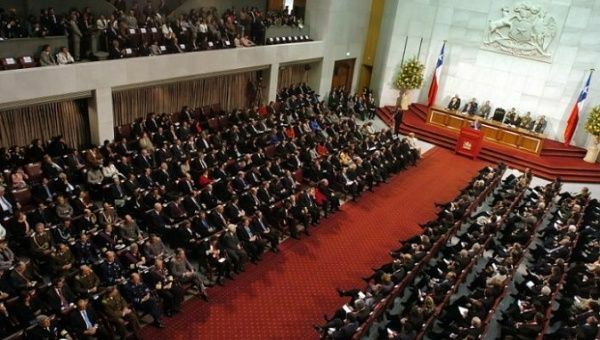 July 13 (teleSUR) Legislators in Chile’s Lower Legislative Chamber have passed a resolution rejecting intervention by the United States in Venezuela, responding to threats of a military option by U.S. President Donald Trump. The resolution “communicates to the United States government, through our foreign minister, the rejection of the Chilean people of any military intervention in Venezuela, and urges the government to respect peace,” the statement says. The statement also implores the United States to respect international norms of non-intervention in the internal affairs of other states, out of respect for self-determination and peaceful resolution of conflicts.